Same day dental implants not only restore the function and aesthetics of your smile, but allow you to take advantages of these benefits immediately, as well. Dr. James Slaman places same day dental implants for Albuquerque, NM, patients who would rather not wait to enjoy the advantages of this gold standard tooth replacement option. Immediate function: After surgery, Dr. Slaman secures a temporary restoration to the implants. Patients leave with the ability to use their prosthetic teeth immediately. Instant smile: The prosthetic appliance mimics the look and feel of natural teeth. Not only does it fit in with the rest of the patient’s smile, but it adds youthful fullness to the cheeks, as well. Bone stimulation: When a tooth falls out or is extracted, the jawbone at the site of the missing tooth begins to atrophy. 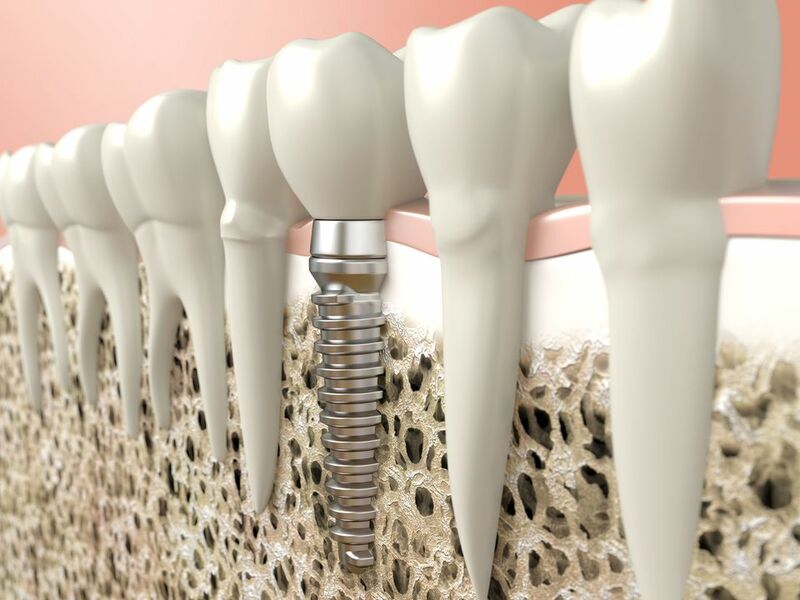 Same day dental implants stimulate the bone to reduce the likelihood of further bone loss. Long-term results: Like traditional dental implants, same day implants boast a very high success rate. With appropriate care under the guidance of a professional dental provider, implants can last 20 years or longer. Be in good general health: Dental implant treatment requires patients to be healthy enough to undergo surgery. Individuals who are unwell because of an underlying condition that affects healing, such as uncontrolled diabetes, are not strong candidates for same day dental implants. Have a track record of good oral hygiene: Patients who have exhibited good oral hygiene and compliance are better candidates than those who have not. Although one's past behavior does not always reflect future actions, dentists often use it as a benchmark for determining which treatments are most appropriate. Be free of periodontal disease: Because gum disease can undermine your overall oral health, your gums should be completely healthy before you can qualify for dental implants. Not smoke: Smoking increases the risk of dental implant failure and other complications related to surgery. A dentist may require a patient to stop smoking or to significantly cut back on tobacco and nicotine use for several weeks before placing same day dental implants. Have strong bone: The surgical site must be strong enough to stabilize the dental implant and prosthesis. Patients without enough bone tissue may need to receive a bone graft prior to dental implant surgery. Most dental implant surgeries require patients to wait several months after the initial surgery so that their bodies can heal and fuse with the new implant. Same day dental implant surgeries are slightly different. Patients can receive their dental implants and restoration during the same appointment. Same day dental implants stimulate the bone to reduce the likelihood of further bone loss. After placing the dental implant into the bone, the dentist does not immediately suture the gums to cover the implant. Instead, he attaches a temporary prosthetic to the dental implant. During the months that follow, this restoration remains in place and allows the patient to function normally. After your bone has fused with the implant to form a stable foundation, the dentist replaces the temporary prosthetic with a permanent one. Offering patients more than 20 years of experience, Dr. Slaman regularly has consultations for those interested in same day dental implants. Our office can help with all facets of the treatment, from understanding the procedure in-depth to offering finance options such as CareCreditⓇ and in-office payment plans. Call us today at (505) 881-7586 to arrange an appointment.